BEAT the PHILLY and sugar with an electric mixer until smooth. Stir in the gelatine and chocolate until smooth, then stir through the passionfruit and lime and then fold through the whipped cream. Stir through one third of the egg whites then gently fold through the remaining whites. Pour the mixture over the prepared base. Chill for 3 hours or until set. COMBINE the extra passionfruit with the sugar in a small saucepan, stir over a low heat until the sugar has dissolved then simmer for 5 minutes, stirring until the glaze has thickened a little. Cool. 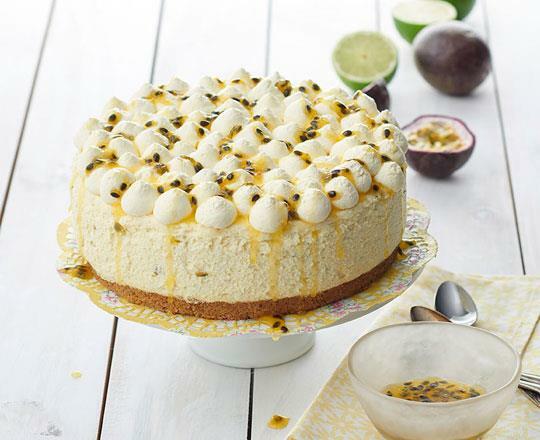 PIPE or spread the cream over the top of the cheesecake, then drizzle with the passionfruit glaze. Serve immediately.